What is the scientific diagnosis of what is a dinosaur, and what is just another archosaur? Several skeletal characteristics are currently used as diagnostic dinosaurian features. You may also view a large-screen picture of a dinosaur skeleton for a lesson in anatomy. Some basic dinosaurian modifications to the ancestral archosaurian skeleton: Reduced fourth and fifth digits on the manus (hand); pes (foot) reduced to three main toes; three or more vertebrae composing the sacrum (region of the vertebral column which attaches to the pelvis); and an open acetabulum (hip socket; see below). Some of these features were modified during the evolution of later groups, but these features are considered to be synapomorphies, or shared derived features, for the Dinosauria; the first dinosaurs had these features, and passed them on to their descendants. One important dinosaurian synapomorphy is the perforate acetabulum, simply a "hip bone" (actually three connected bones, together called the pelvis) with a hole in the center where the head of the femur ("thigh bone") sits. This construction of the hip joint makes an erect stance (hindlimbs located directly beneath the body) necessary  like most mammals, but unlike other reptiles which have a less erect and more sprawling posture. Dinosaurs are unique among all tetrapods in having this perforate acetabulum. A more in-depth classification of dinosaurs uses modifications to this basic hip structure, and many other characters, to help differentiate between separate groups of dinosaurs, and hence reveal to us dinosaurian diversity. The Dinosauria contains two major groups of dinosaurs: the Ornithischia, or "bird-hipped" dinosaurs, and the Saurischia, or "lizard-hipped" dinosaurs. The most prominent visible difference between the two types of hip is the orientation of the pubis, shown in white in the picture above. In saurischian dinosaurs, this bone points toward the front of the animal, and flares into a keel at the forward end. Ornithischians have a reversed pubis, which points toward the tail and lies alongside and parallel to the ischium. 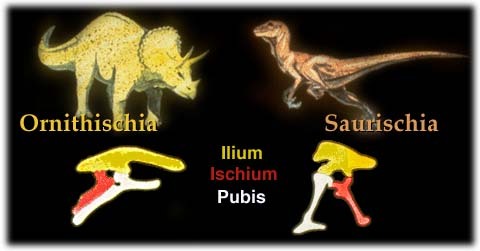 Additionally, some ornithischians have a projection at the forward end of the pubis. The first recognition of the two groups was made by H.G. Seeley in 1888. The etymology behind the two names ("bird-hipped" vs. "lizard-hipped") is rather confusing, since some saurischians had bird-like hips, and ornithischians' hips were somewhat birdlike due to convergent evolution, not due to shared ancestry. Birds are apparently descended from saurischian dinosaurs, but have a reversed pubis like ornithischians do. Some close relatives of birds within saurischians have this same feature, too, so the ornithischian-saurischian dichotomy is not so simple. The names "Ornithischia" and "Saurischia" are used to refer to the common ancestry of their respective members. The names don't necessarily have to mean anything. They are just names, that's all.